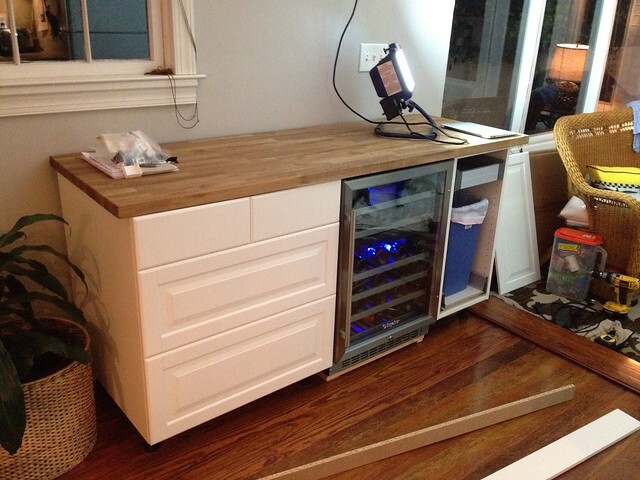 Here's a look at the finished wine bar area. 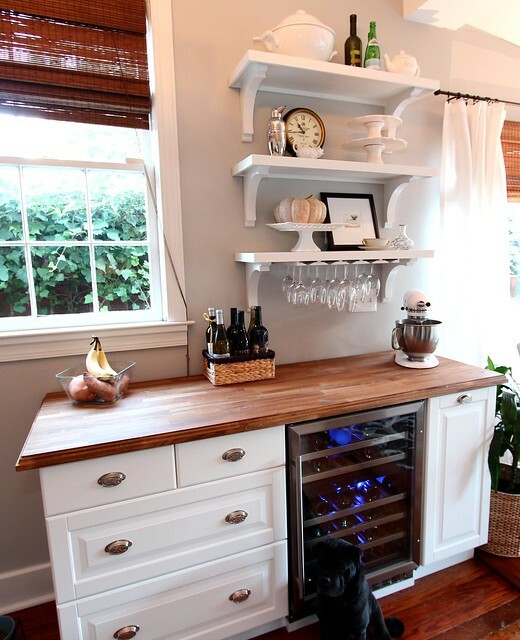 We have a slew of other blog posts related to the wine bar. If you're interested, be sure to check them all out under our "Wine Bar" section. 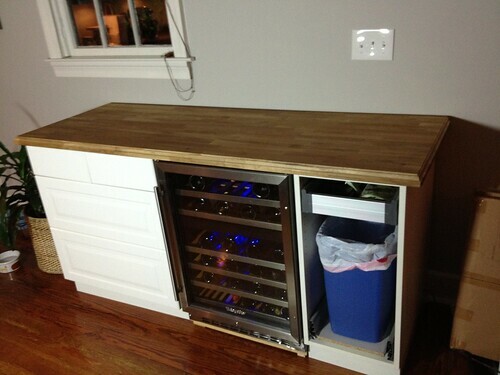 This quick fix of a project kicked off two Sundays ago as we assembled and installed our newly purchased cabinets. After that first day of effort we were looking good and only needed to place the butcher block on top of the new cabinets to get a feel for the finished product. The whole assembly was just a shade under six feet, and the piece of butcher block we had was six feet exaclty. Rather than trimming to size, we opted to keep the few inches of overhang on either side to give us a little bit more counter space. 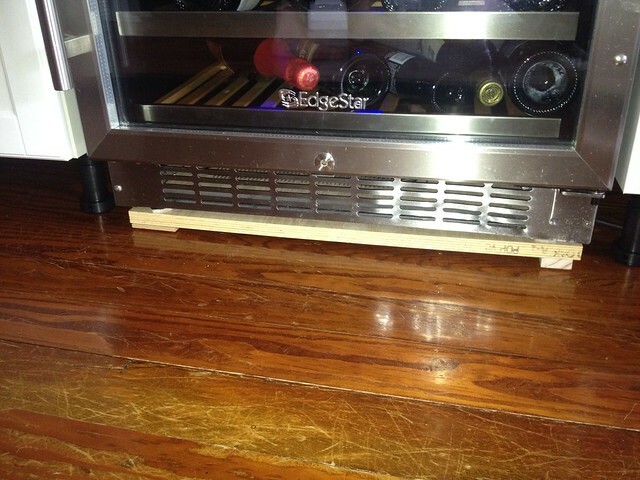 One of the first things we noticed after we had everything in place was a problem with the wine fridge's height. The top of the fridge was a little short from the bottom of the counter, and the gap that was there, from 1" to 1 1/4" left to right, just looked bad. To resolve this I ended up building a small platform for the wine fridge using a piece of leftover oak 3/4" plywood and a few spacer pieces of wood screwed to either side, one 1/4" thick and one 1/2" thick. I placed a few felt feet on the bottom of the platform, then slid the fridge back into place. The first is nearly perfect, and much better looking as an end result. Now it just needs a little bit of trim to cover the fact that it sits on a platform, which should be easy to cut and instal. With the wine fridge situation settled, we moved onto placing the butcher block on top of the cabinets. That's when we noticed a somewhat big issue. There was a large gap along the wall behind the counter. It seems the whole wall is out of plumb and leans out as you move up from the floor. 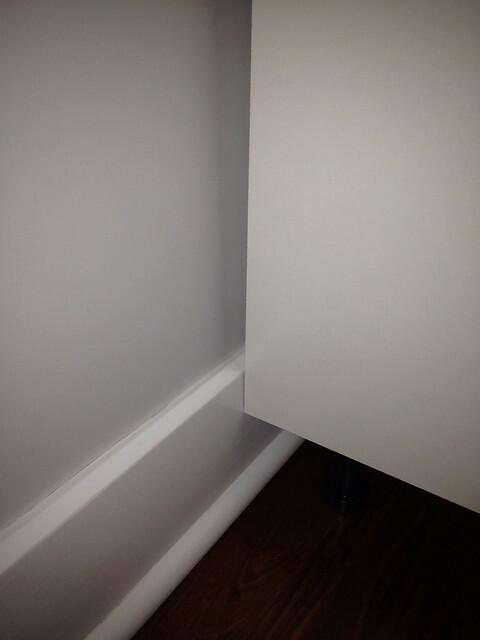 This part of the house is over 110 years old, and this type of lean is not uncommon, but it presents an issue when trying to hang or install cabinetry. The wall is so out of plumb, leaning away from the cabinet, and the baseboard is so tall, several inches above the bottom of the cabinet, we just couldn't get it close enough to the wall to make the gap acceptable. This meant I had to get a little creative with cutting away the baseboard to allow the cabinet a bit closer to the wall. 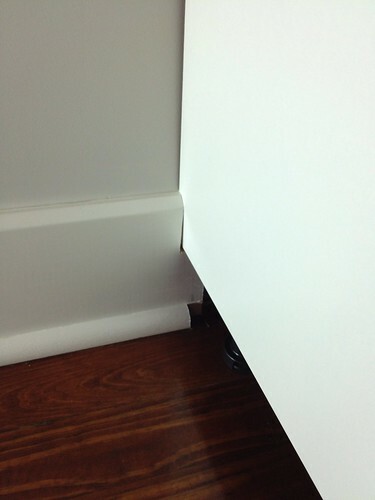 Don't worry, this isn't old original baseboard, this is something I installed a few years ago when we had our kitchen disaster. 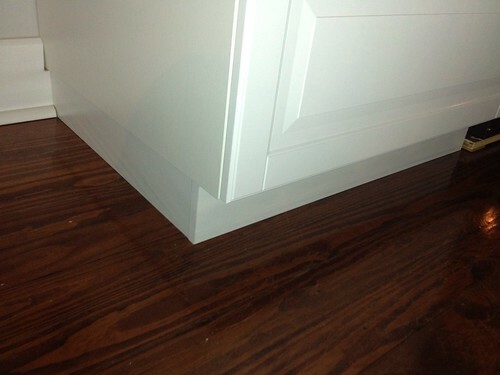 We started the process by marking where the bottom of the cabinet would hit the baseboard. 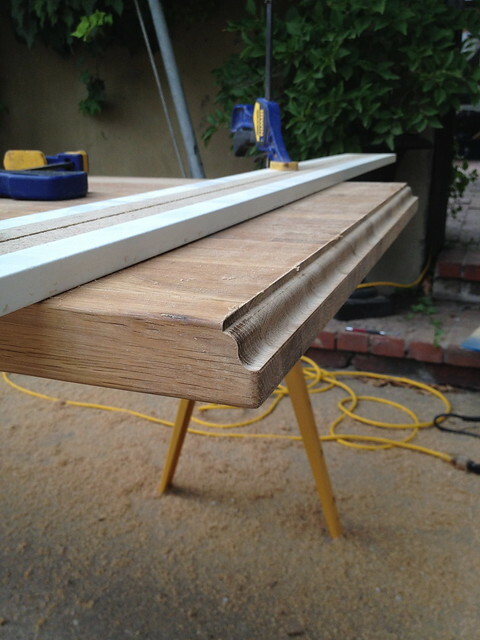 After clearly marking the very odd angle cut that would be necessary, I used my Fein Multimaster to make the complicated cut of the baseboard and shoe moulding to give us nearly a perfect fit for the cabinet. I can't think of another tool that would have made this job easy. 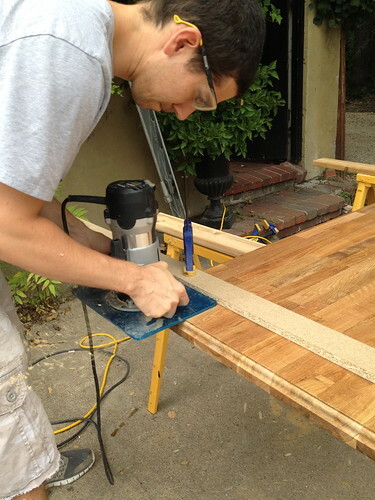 I'm very glad I had this oscillating cutter on hand. 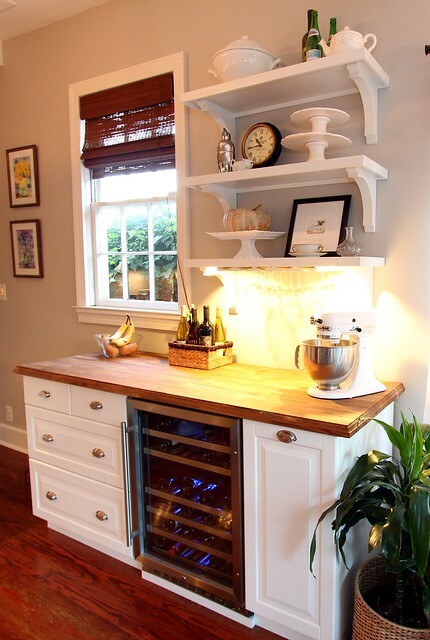 Once pushed back into place, the cabinet was able to rest a little closer to the wall, leaving a more reasonable gap at the counter top. The cut wasn't 100% perfect (it's tough to get 100% with this tool), but it's good enough for temporary. 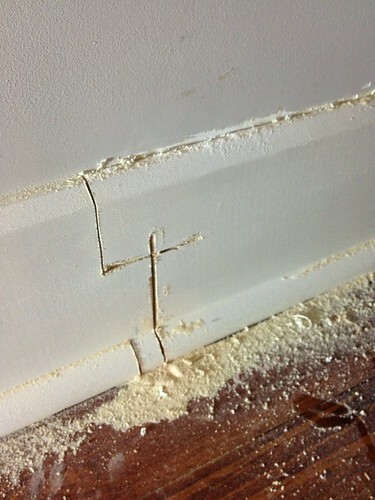 If this were permanent, all we'd really need is a little caulk. The final step of the cabinet install was to snap on the kick plates below each cabinet. This seemed like it should have been a pretty simple task, but then we ran into the issue with the whole kitchen being out of level. In this case, the left most kick plate wouldn't fit without a little trim. 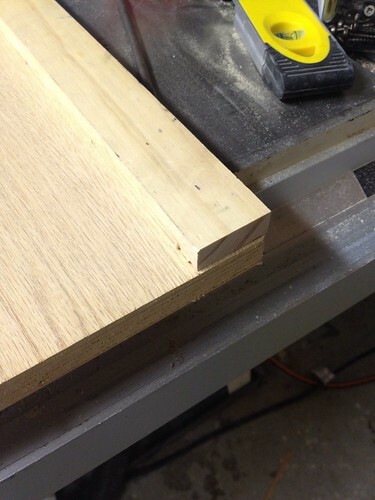 Using my taper guide on the table saw I set it to the angle of my scribe and shaved a little off of the bottom. With the bottom of the kick plate cut, I snapped it in place and took a look at the results. Not too shabby. 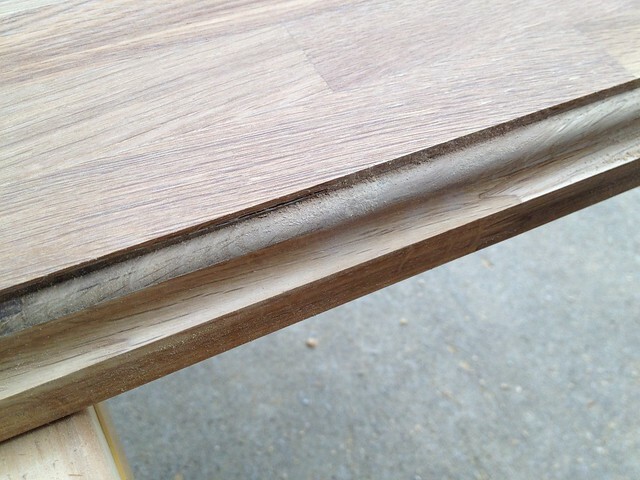 Obviously not a tight and glued miter joint, but, eh, it's temporary (I keep telling myself this). At this point, Wendy was ready to say we were "all good" and move onto the next phase of the project, but that's we're a little disagreement was born. One of the things I didn't like about the butcher block was its square edges. Though traditional, the look is a bit more modern/contemporary than I tend to think fits in our house. The walls were already gray and cabinets white, I just felt very strongly that the square edges of the new new butcher block was...well...boring, and we could do better. The thing I wanted to do was to use our router to put a nice ogee edge on the counter. Wendy, who was "fine" with the stock edge, was more nervous that the router might "jump" and ruin the piece of butcher block. We went back and forth on this for a few days until I came up with a plan. I said, "lets put the edge just on one side of the long piece. Then, if it's not looking good, we can just trim it off and put it back to the way it was. But if you like it, we can apply it to the other edges." Since we had enough extra overhang, this satisfied Wendy's concerns, and let me give it the old college try. I made several passes with the router and had a single decorative edge for Wendy's approval. She decided that she liked it, and that I hadn't made a mess of it and she trusted me to do the rest, so I went ahead and did all three sides. The only problem we had was actually no fault of my own. While routing the edge, I uncovered a hole in one of the pieces of wood. It was obviously a knot that had been glued, but the glue fell out when I cut the edge. This speaks far more to the quality of the product than anything, and the grade of lumber that IKEA uses. I have way more to say about this topic, but I'll save my little rant for a later time. Until then, I had a problem to solve. 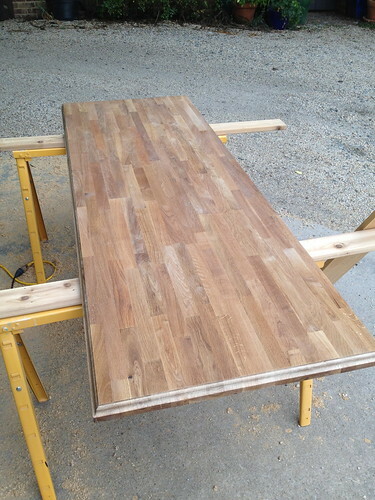 I ended up mixing up a few different wood fillers to get the color I was looking for that would match the oak counter. After a little filling, drying, and sanding, I think I did a pretty decent job making it blend in. Don't worry, the photo was taken after just the first sanding, I don't leave stuff partially sanded, that's for sure. The end result is something that I'm very, very happy with. 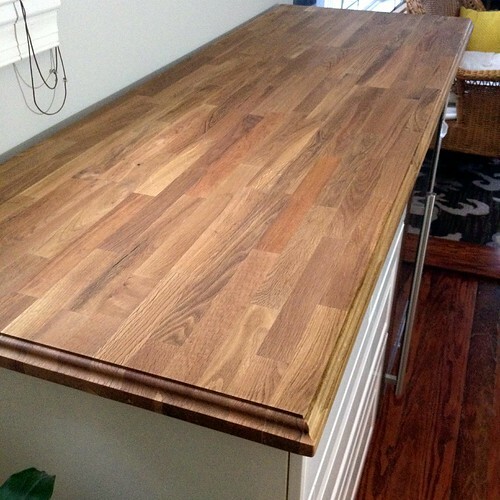 I'll go into way more detail in a future post on how you can do this sort of thing, and how to prep your counter for install. But for now, we can just look at some photos of the finished product. All I can say is that I really, *really* like how the new edge looks. It only took a few hours of extra effort, but it dressed the counter up so much and made it work way better with the aesthetic of our house. 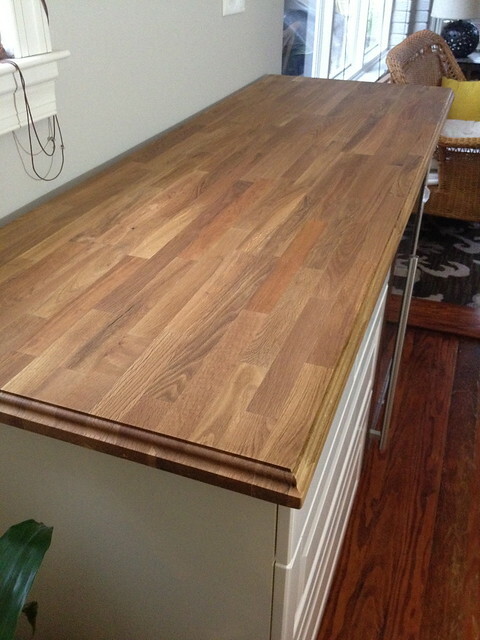 We made the final placement of the counter top and secured it in place with the provided screws. Then we started to oil the heck out of the counters. The oil really brought out the highlights on the wood and gives it so much more character. Like I said earlier, now we're just waiting on the final IKEA items so we can attach the door front that acts more like a drawer front. Can I tell you just how impatiently we're waiting for these pieces? IKEA didn't have them in stock, and we had the option to drive back down to Woodbridge the next day to pick them up, but we opted to pay the $15 shipping on the $13 in items to avoid the trip. Now it's been nearly two weeks and we still don't have the items. We should have just had a friend pick them up when they went to IKEA last weekend. So annoying that we have photos like this next one to show you. Hey, nice trash can...but I digress. Now that we're a little while on from this original post, here's the "final" photo of the area with the shelf lights turned on as well. What do you think? Is this worth the effort? Should I get to work on the small trim piece? Should I get to work on building the shelves? I think I know the answer to those last two questions. The edges were the first thing I noticed! At first I was all impressed that Ikea countertops came with routed edges, but then my brain kicked in and was like wait, clearly that's an Alex and Wendy customization. It looks fantastic, and I can't believe how well that wood putty blended in. Why, thank you! You know I tried to convince Wendy by saying "don't you know how much more interesting of a blog post a routed edge will make?" I was trying every angle to get her permission to do it. The wood putty did turn out pretty well, though it is more obvious once the wood was oiled. If you look really closely you can see the dot on the front edge just above the garbage can. Looks good. What type of oil are you using on the counter? When the contractor finished his part of the kitchen work, we were left with unfinished counters and oiling them is a time consuming process. Now that we have been using them awhile, it is time to do it again ... something that I am not excited about! We're using a food safe mineral oil. Very simple. From everything I've read, this is what most people recommend. Just needs to be applied enough until it builds up, then once a month for the first year. Then every few months. The edges look great! 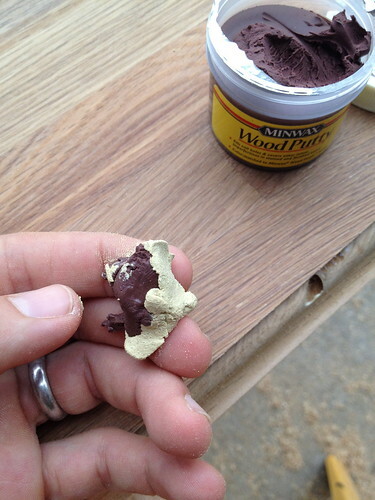 I'm also impressed how well the wood putty blended. My dad was cutting the hole for the sink in my Ikea butcher blocks yesterday and the saw jumped on him and left a pretty nasty gouge. Unfortunately the sink didn't cover the mark so we ultimately decided to flip the piece over and use the "down" side as up. I think it will work find because I'm planning to sand and restain them and we couldn't tell a big difference between the side marked as down. We just cut the hole for the sink the other night, and I freaked out a fair amount, so I can relate. It went well, but oh my, I hate those "this is the last step and it ruins the whole project if you mess it up" moments. That's good that the down side is as good as the up, on our blocks you can definitely tell a difference. There's lots more knots on the bottom. One word of caution. Be careful on the staining. I originally wanted to stair our counters, but I looked into it and the foodsafeness (that's a word, right?) of the stain didn't satisfy me. So we're just oiling with mineral oil. It looks great! Of course you're reminding me we need to finish our Besta cabinet install in my husband's office. Just need to affix the lower cabinets and we're done. Great idea, Jennifer. Thanks, and good luck finishing your Besta cabinet! This looks amazing! Nice job with the edge. Looks much more polished and not at all IKEA to me :) Would you like to come to my house and make things look pretty? Also, good lucky with the 4-legged friends tomorrow. Thanks for the well wishes for tomorrow. I'm a total mess. looks great! 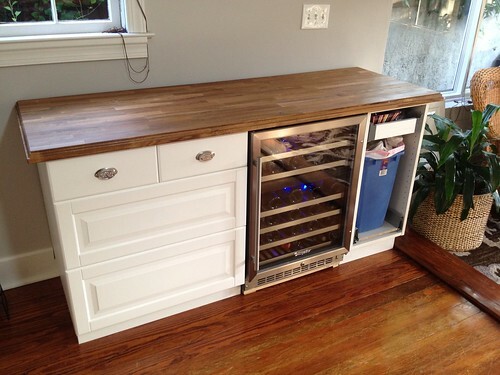 such a creative solution for more cabinet space too. 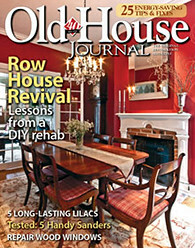 Hey Alex, PLEASE, don't assume that the walls in your 110 year old house are just because the house is "old". I build and install kitchens for a living, and I can flat out tell you that some NEWLY constructed homes are NO BETTER. 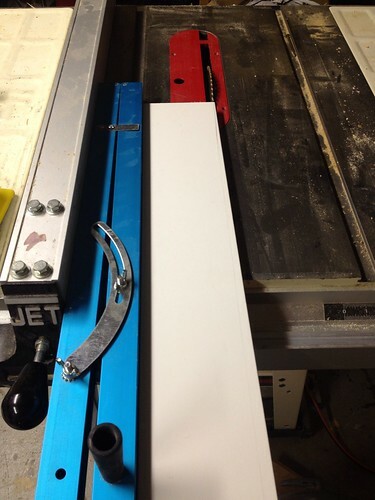 It's not uncommon for a new (1990 or later) house to have 8 foot long wall sections with as much as 3/4" difference off square (I'm mainly talking about wall surfaces where you'd be butting-up a counter top against. 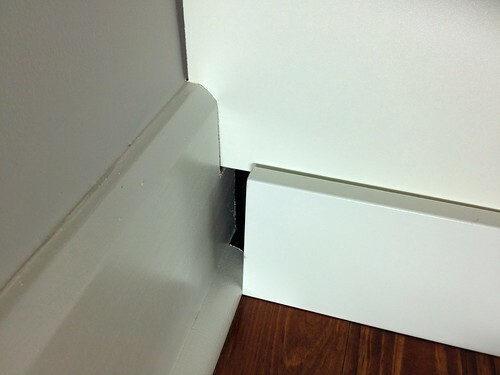 Some cheaply build low-income housing where we regularly replace counter tops often have one particular wall with a 1/2" difference (off square) on a TWO FOOT LONG WALL. That's a lot when you have to cut 1/2" off the counter top edge. Speaking of this, you did a good job installing this. I would go ahead and do the wall seam with acrylic latex caulk to really dress it up. 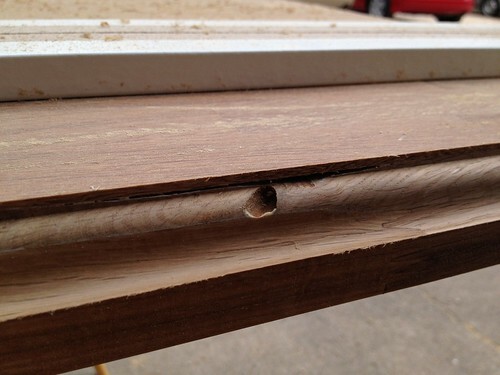 Even if you say it's "temporary", latex caulk is easy to scrape off later. If you ever want free advice/tips for complex cabinet installations (like redoing the kitchen), don't hesitate to ask me. Looks incredible! How lucky to be/have such a talented woodworker-pronlem solver. Wishing your pets speedy recoveries! I milled a 200 year old Arlington white oak and now have about 1000 board feet of 5/4 boards, most 20x110, some live edges. Would make cool table top or counter if you want to compliment that butcher block. Excellent job on the wine bar! The extra counter space is a real plus!! Time to open a bottle in celebration of a job well done!!! That came out beautifully. I love the routed edge. So awesome!! I'm looking to do something similar in our bathroom of all places. Our master bath is divided into 2 parts - one is a vanity sink area that I'm looking to make into a coffee station so that we don't have to go down in the mornings for coffee. I'd like to put a mini fridge and microwave up there as well so that we can have water and snacks. Can I ask how much your project cost you, including the fridge? Did Ikea help you design it from measurements? Thanks! Did you build this entire piece or buy it? I am looking for this EXACT bar with fridge for our new home!! Any advice would be greatly appreciated! Hi Ashley. The cabinets and counters are from IKEA (see link in first sentence) and the shelves were custom built. Good luck! Hi Wendy, I absolutely love it. very classy job!Could you please show inside of the drawers? How did you assemble them? I will appreciate your response. Hi: Loved your work. I am planning on doing something similar to this in my home. Great to see it come out so nice. If you have any Pro's or Con's, would love to hear them. Hi there! i am looking to do something similar in my apartment, so mine cannot be flush to the wall. 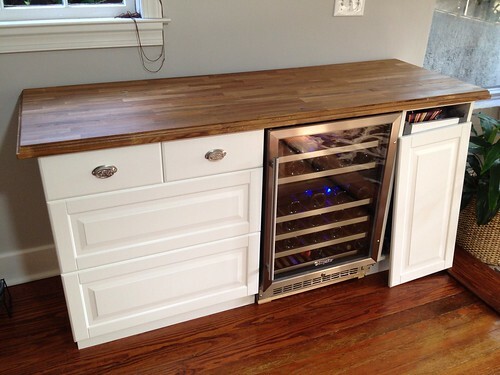 Looking all over for the perfect wine fridge - can you please tell me the dimensions of yours? Hi Carly - It's made by Edgestar. I believe it's a 48 bottle dual zone model that's 24" wide, 35" tall, and 21" deep. Good luck with your project!